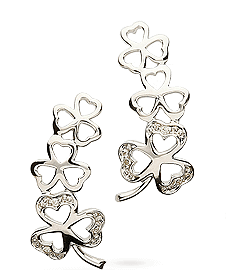 Online since 2004 and based in Ireland, we have been specializing in Celtic jewelry for more than 25 years. The designs we create however are so much older than that, some dating back as far as 3,200 B.C. Celtic artisans have been creating jewelry for many generations, a tradition passed down time and time again. We are honoured to carry on this proud tradition to the best of our ability and we hope you enjoy owning our Celtic wedding rings, as much as we have enjoyed hand crafting them. 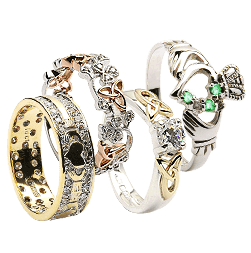 We specialize in Celtic jewelry and handcrafted wedding jewelry, and have over 25 years experience in the Celtic Jewelry & Arts industry, so you’re sure to find the ideal ring to make your wedding day even more special. We take great pride in our work and we’re sure that you will appreciate the piece as much as we have enjoyed making it. In fact, we guarantee it – if you are in any way dissatisfied with your purchase, we offer a 30 day return money-back guarantee. 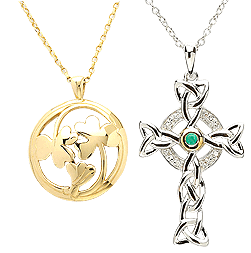 All our Celtic jewelry is handcrafted here in Dublin and every piece is hallmarked as proof of authenticity. All diamonds are fully certified by the Gemological Institute of America. Our rings symbolize the holy sanctimony of marriage whilst expressing a rich history and proud heritage, and as such, are an elegant way to express your sentiments on your wedding day. All our white gold wedding rings, silver wedding rings, sterling silver cross rings, unique Celtic pendants, gold piercing jewelry, tie pins, and more, are created here in Ireland. 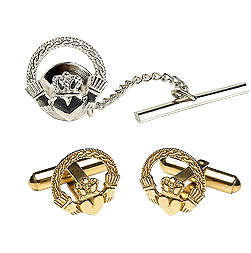 All gold items are hallmarked in the Dublin Castle Assay Office, which is your guarantee of the gold's quality. So if you are looking for unique wedding ring jewelry, we can offer an array of unrivalled designs, every item both unique and custom made. When you place your order, we begin the process of getting your purchase designed and cast. Created with care and dedication by skilled and experienced craftsmen, our authentic Celtic wedding rings and handcrafted wedding jewelry are of the finest quality. For more information and a step-by-step photograph guide to the making of our Celtic rings, have a look at the Making of the Claddagh Ring. Then simply browse the menu on the left for your perfect item(s) of Celtic jewelry and place your order. Thank you, or as we say in Ireland: Go raimh maith agat.